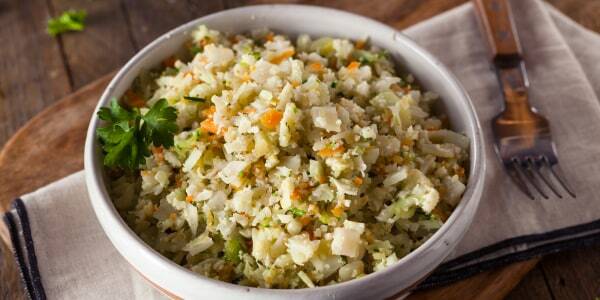 If you're trying to cut down on carbs and grains, or just eat more vegetables, these healthy recipes with riced cauliflower will rock your dinnertime. Have you tried the cauliflower rice yet? If not, it's time. Cauliflower rice — which is just cauliflower diced into tiny rice-like pieces — is a great high-fiber, low-cal, low-carb and grain-free replacement for regular rice. And it's adored by thousands of devotees, including celebrities like Mila Kunis, too. Whether you make your own riced cauliflower or buy bagged cauliflower rice from stores like Trader Joe's and Whole Foods, you can use it to make stir fry meals, risotto and plenty of other dishes that call for regular rice. Beyond standing in for traditional rice, cauliflower rice is also a versatile starting point that can be turned into ground beef-like crumbles to fill tacos, make a flourless pizza crust, or it can be used as a wheat-free substitute for couscous. If you're trying to cut down on carbs or grains or just eat more vegetables, these seven recipes with riced cauliflower will rock your dinnertime. 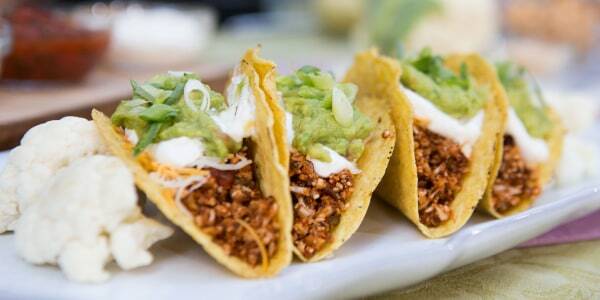 These meat-free tacos turn cauliflower rice into the main attraction. The savory filling is vegetarian- friendly and is so tasty it will please meat eaters, too. Grated cauliflower has the al dente texture and size of rice grains but unlike regular risotto, this recipe cooks up in minutes. White beans blended with water create the creamy comfort we love about risotto, making this a healthy dish without the guilt of a high-fat, high-carb meal. Prepare to be amazed. Gluten free and missing pizza? 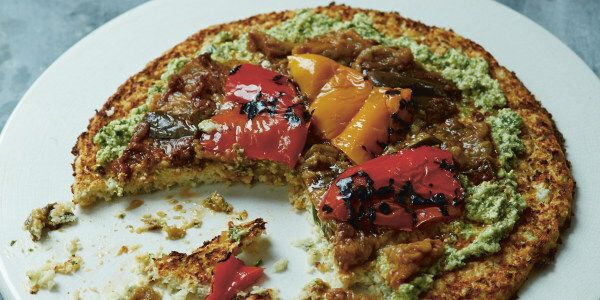 Try this amazing paleo pizza with a crust made from riced cauliflower. Add your favorite toppings and enjoy the wheat-free goodness! How do you make a pizza crust with cauliflower but no flour? Joy Bauer explains! 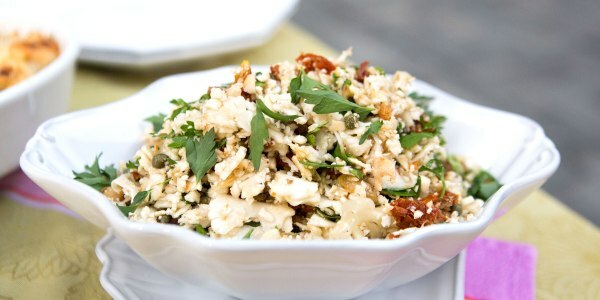 In this beautiful and healthy side dish, riced cauliflower replaces couscous, which makes it a great option for those who need to (or prefer to) avoid pasta. 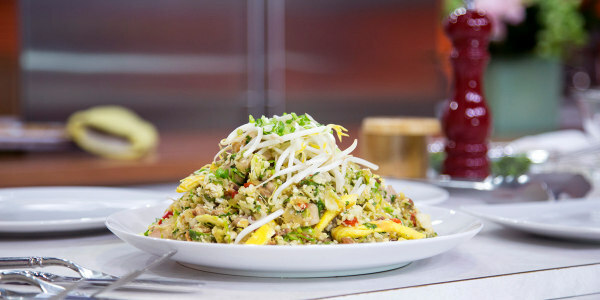 Australian cookbook author and TV host Pete Evans shares his recipe for a paleo-friendly cauliflower rice stir-fry that's packed with protein and veggies. Raw cauliflower has an incredible crunch and a hearty, satisfying texture. 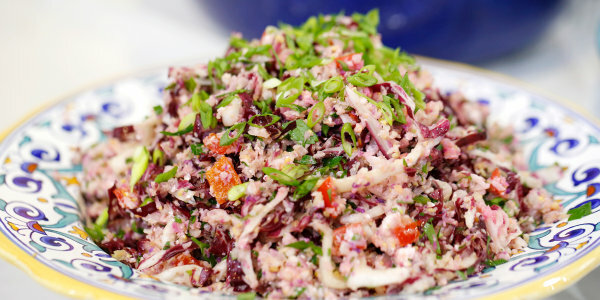 Serve this flavorful salad as a side dish or for a light vegetarian lunch.